Beyond Baked » One ingredient whole food strawberry treats! Home Blog One ingredient whole food strawberry treats! 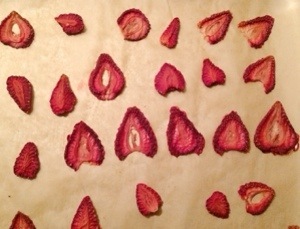 Place strawberry slices on cookie sheet lined with parchment paper. Dehydrate in a preheated oven at 200 degrees F for 2 1/2 hours. They remind me of a fruit roll up, or candy.